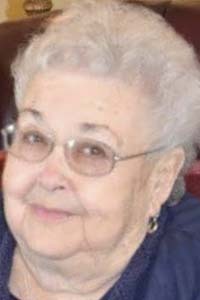 NILES — Naomi Ellen Pelles, 85, of Niles, passed away peacefully Monday, June 4, 2018, at Trumbull Regional Medical Center in Warren, with her family by her side. She was born Nov. 16, 1932, in Bronx, N.Y., the youngest daughter of the Rev. Joseph and Anna Oberton Dudash. Naomi was married to the love of her life, Joseph Pelles Jr., on July 4, 1953, and became a Navy wife. After celebrating 55 years of marriage together, Joseph passed away on Oct. 1, 2008. They were both of the Christian faith. She was formerly employed at GE Trumbull Lamp in Warren, sold real estate and also drove bus for the Niles City school system. Naomi cherished spending time with her family, especially her great-grandchildren. In her younger years, she was an avid boater, an amazing cook and loved to garden. She was a true animal lover, from all of the backyard wildlife to her favorite pets, Sheba and Elvis. Loving memories of Naomi will be treasured by her only daughter, Joanne and son-in-law, Clifford Bequeath of Niles, with whom she made her home after Joseph’s passing; gradndaughter, Rochelle Sadowski and her husband, Robert, as well as her two great-grandchildren, Austin and Lauryn Beneke, all of Bellbrook, Ohio. Naomi also is survived by her sister, Mildred Rock and family of Riverside, Calif. Besides her husband, her parents preceded her in death. Her family wishes to extend a very special thank you to Dr. Ramona Sheth, Dr. Mangalji and Dr. Mahjoub, as well as the Hope Cancer Center in Warren, for the excellent care Naomi was given over the past several years. At Naomi’s request, there will be no calling hours. A private family service will be held at a later date. She will be laid to rest in Niles City Cemetery, next to her husband. Arrangements are being handled by the the Joseph Rossi and Sons Funeral Home, Niles.